Halloween is just around the corner and what better way to prepare than with some horrifying decorations and a frighteningly fun event? This year, you'll be able to purchase a variety of torture-chamber themed furniture for your bungalows, along with some extra luxuries such as the experimental mini-bar and even an ectoplasma TV! But of course, Halloween is not just inside - you can look forward to some skeletal musicians, a headless horseman, abandoned tire swings and much more! 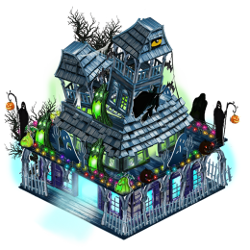 Collect Halloween Candy by placing decorations from now until November 2 at 10:59am CET. You have the chance to win some ghoulishly great prizes - from a haunted suit of armor all the way to a brand-new attraction: the Haunted House! Find out more about this blood-curdling event in our forums, or head on over to the game and dive right in!